I grew up on a farm and have kept pet dogs, cats and rabbits all my life. 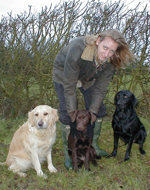 I've had an interest in animal behaviour since childhood, and began training my own dogs for obedience and basic gundog training in my early teens. More recently I bred several litters from my own pet dog. While at school and university I spent many weeks of work experience with vets and veterinary nurses, gaining experience in handling animals of all shapes, sizes and temperaments! I have a degree in Zoology from London University, and in June 2008 I was awarded a Distinction in the Post-Graduate Diploma in Companion Animal Behaviour Counselling, which I completed at Southampton University. This rigorous and extensive course covers all the companion animal species and includes detailed reference to behavioural development, ethology, neuropsychology, pharmacology, learning theory, psychology, the law relating to pets, animal welfare, and training: theory and practical experience. I am a Full Member of the Association of Pet Behaviour Counsellors (APBC), and an Animal Behaviour & Training Council (ABTC) Registered Clinical Animal Behaviourist. The Association of Pet Behaviour Counsellors (APBC) is an international network of experienced and qualified pet behaviour counsellors. Members have to meet high academic standards and have extensive practical experience, and the APBC Code of Practice ensures that members maintain high professional standards so that clients can be assured of effective, humane and appropriate advice at a reasonable cost. 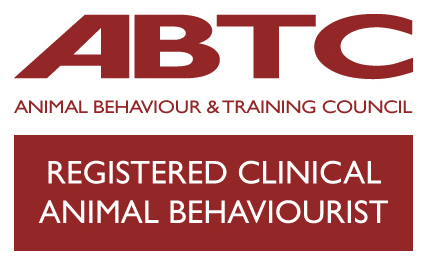 The Animal Behaviour and Training Council (ABTC) is the regulatory body that sets and maintains the standards of knowledge and practical skills needed to be an animal trainer, training instructor or animal behaviour therapist, and it maintains the national registers of appropriately qualified animal trainers and animal behaviourists.